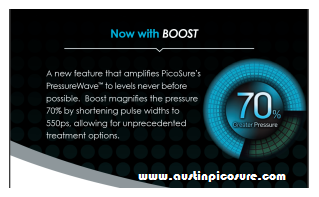 The PicoSure laser for tattoo removal now has a Boost upgrade software package that increases the speed of the picosecond pulse to create an even more powerful PressureWave for the toughest inks. The result is an increase in the photomechanical energy by 70%. This improves the rapid destruction and elimination of tattoo inks, regardless of color, while maintaining safety to the patient’s skin. When PicoSure rolled out the Boost upgrade I was the first practitioner to receive it and I’ve been very pleased with the results. If you would like a demonstration of the PicoSure in the form of a FREE test spot or FREE consultation on your tattoo I can be reached in Austin, TX @ my new location: Austin Medspa 512-479-9997. Did providers have to pay for the upgrade of Picosure boost or did all of the machines receive it?